The lingo of time: UFO film touches down as one of year’s most impressive cinematic offerings. I didn’t think that any film this year would stack up to 10 Cloverfield Lane. So much for that. Arrival offers another strong female lead in an equally gripping sci-fi masterpiece. The latter film, directed by Denis Villeneuve, in many ways transcends its genre to become, in this reviewer’s opinion, an Oscar contender. Inherent in the title is the film’s big idea. This isn’t an Independence Day or War of the Worlds alien invasion action film. It’s merely an arrival of extraterrestrial vessels, and protagonist Dr. Louise Banks (Amy Adams) must decode the aliens’ language. 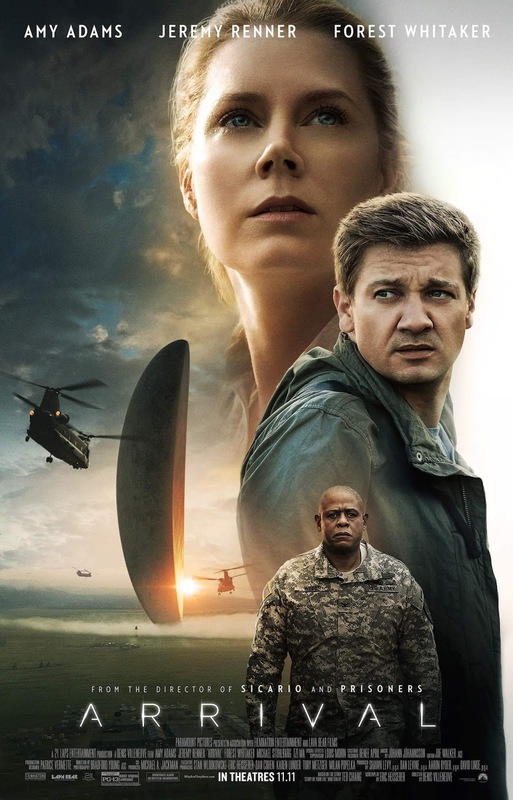 Skilful in its audio and visual manoeuvrings, Arrival plays with our perceptions of language and time, and challenges our tech-driven migration toward impulsive behaviour. The film leaves the patient viewer processing its implications long after the credits roll. It even gets into Tennyson’s “Tis better to have loved and lost” bit. Adams, along with supporting cast Jeremy Renner and Forest Whitaker, offers a strong performance. All three actors let the film’s innovative premise and underlying mystery, rather than their characters, take centre stage. The opening scene reveals that Dr Banks experiences a major loss. At the university where she teaches linguistics, she discovers that twelve alien craft have touched down at various points across the Earth. Colonel Weber (Whitaker) recruits Banks (the language expert) and theoretical physicist Dr Ian Donnelly (Renner, the scientist), then brings them to the Montana field over which the North American alien contingent hovers. Weber wants the duo to get into the ship and figure out why the visitors are here and what they want. This objective drives the remainder of the film, which builds to a Shyamalan-like climax that packs an emotional wallop. The filmmakers’ tight focus on Banks keeps the viewer in tune with her feelings. One example is her reaction to the news of the arrival. She (and we) learn of the event not by seeing giant spaceships approaching, but rather via a news report in her quiet and mostly vacant classroom. A student asks her to turn on the TV. Although we hear what the reporter says, the camera focuses on Banks. As the shock registers on her face, we’re right there with her. And isn’t that how it would happen? We’re going about our business, oblivious to the outside, and then… we find out. The viewer/protagonist connection continues the first time Banks enters the UFO and absorbs her reality. She struggles for breath in her oxygen mask and gazes up a dark passage that leads to a light source. You feel her uncertainty, her trepidation. The tension carries over to the coal mine-like chamber in which the humans and aliens interact. A bird’s echoing chirps – the bird confirms oxygen levels – create a jarring sensation as Banks and Donnelly first approach the bright transparent screen that separates them from the aliens. Many films offer sleek alien craft and creatures that resemble octopuses – this film refers to them as “heptapods” (and Abbott and Costello) – but rarely are these conventions used in such a thematically inventive way. The film’s first major theme is language and, more broadly, communication. While Banks and Donnelly race to translate the aliens’ complex symbols, some other countries elect to communicate with the visitors via games. Banks points out the flaw in this strategy: games have winners and losers. This human winner/loser or good/bad mentality takes root in certain individuals and nations that have a trigger-happy attitude toward the aliens. It’s sad to think that some people would actually think the Earth would stand a chance: if aliens figure out how to get here, then they’re more advanced than us. The circular shape of the aliens’ symbols ties into the film’s other major theme: time. We’re accustomed to thinking of time as linear. Arrival, applying that circular concept to its structure, trounces on that tendency and challenges us to see the bigger picture.